The formation of World Sweeping Association was announced in November of 2012. The World Sweeping Association’s management team is directed by Ranger Kidwell-Ross, who founded the multi-award-winning WorldSweeper.com website in 2005. However, Ranger’s total involvement with the power sweeping spans more than a quarter of a century. During that time he has traveled around the world as an ambassador for power sweeping, as well as become the most published author in the world on the topic. Ranger began his career in power sweeping in 1987, when he began creation of the first-ever manufacturer’s newsletter for power sweeping contractors, The Supervac Quarterly . A few years later he founded the first-ever informational magazine for the power sweeping industry, American Sweeper magazine. Produced over the course of the succeeding 10 years, American Sweeper elevated the knowledge and professionalism of pavement sweeping and those who perform the task. Ranger also designed and maintained, for over a decade, the first sweeper manufacturer website. This was done for Schwarze Industries, Inc., which at the time was owned by founder, Ernest ‘Bob’ Schwarze. As editor of American Sweeper magazine, Ranger also traveled worldwide as an ambassador for the U.S. power sweeping industry. The stories he wrote during his trips to Asia and Europe each garnered a national Award for Publication Excellence, the latter winning a rare Grand Award. In fact, industry-related stories, magazines, websites and other work Ranger has produced have received at least one national APEX Award for Publication Excellence every year between 1994 and 2012, an unbroken track record of national APEX awards no other U.S. individual, industry or company can claim. In addition to meeting with public, private and government officials around the world on the topic of power sweeping, Ranger has been a speaker at several U.S. trade shows and has written articles on power sweeping for a number of U.S. trade publications. Another of his previous accomplishments includes instituting successful negotiations with the Excise Tax Division of the IRS, which resulted in the first confirmation that the federal excise tax on auxiliary engine fuel used in twin-engine sweepers could be rebated. For many years Ranger had been encouraged by a number of high-level U.S. contractors to bring his singular talents to building a sweeping contractor membership association. Especially in recent years, with the explosion of third-party vendors, the power sweeping industry has needed a nexus where professional industry information is archived – as well as a venue where breaking news may be disbursed rapidly when necessary. However, it was only due to the unresolved conflict of interest issues by the NAPSA management that the step to create WSA was taken – reluctantly, but with the enthusiasm and professionalism that marks Ranger’s track record of sweeping industry innovation. The WSA Advisory Board is composed of some of the leading contractors in the United States. Several of these had been Founding Members of NAPSA; however, they were unable to remain wholly supportive of the direction taken in recent times by that organization. The World Sweeping Association is a non-partisan membership group dedicated to providing the targeted information that contractors need and can use to stay at the ‘top of their game.’ At launch, the site offered over 250 articles targeted to power sweeping contractors, including more than 80 audio interview podcasts with leading U.S. sweeping contractors and other industry-related professionals. A number of other member benefits were in place at start-up, as well. The WSA management team is dedicated to continually investigating any opportunities for increasing membership benefits. We invite you to take a look at WSA’s opening slate of member benefits, and we welcome any ideas for adding to them. 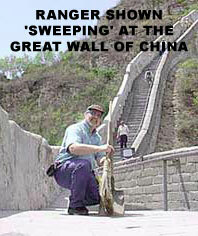 The World Sweeping Association is envisioned as becoming the hub of the U.S. and worldwide power sweeping industry.